Apple will be making a transition to the 64-bit technology for the macOS users. They are putting pressure on the developers to update their macOS apps. There will be alerts to inform you that you are running the 32-bit apps that are incompatible. Apple will display a warning about the incompatibility of the 32-bit app on the latest macOS version. This warning is with regards to the transition to the 64-bit technology. 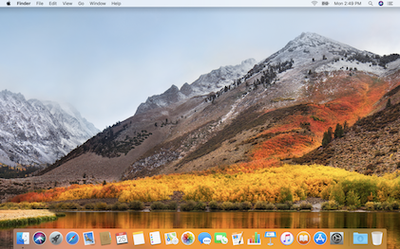 For all the users on macOS High Sierra 10.13.4, when they open any of the apps whether old or new that run on the 32-bit technology, will get a one-time warning displayed. The developers will have to update to the 64-bit technology if users on the High Sierra’s successors, need to use them with full support. There has not been any date set for the 32-bit apps to be defunct. The High Sierra will be the last version of the macOS that will support the 32-bit apps. Apple is keen on developers using the latest hardware that will be compatible with the 64-bit technology. They want the macOS users to pressurize the developers to make the change from the 32-bit apps to the 64-bit apps when they see the alerts. The macOS High Sierra 10.13.4 apps that are not updated to the 64-bit apps will get a one-time alert. This alerts the user that he is currently using the 32-bit technology and this will not be compatible in the future. As of now, no date has been set regarding the transition to the 64-bit apps for macOS and macOS apps. It is advisable for the users to make sure they get the 64-bit version of their favorite apps. How to check whether the apps are 32-bits or 64-bits? The users need to go to ‘About this Mac’ and then click on ‘System Report’. You then scroll down to ‘Software’ and select ‘Applications’. If the ’64-bit (Intel) field says ‘Yes’, then the app is a 64-bit app and ‘No’ will indicate that it is a 32-bit app. With regards to the iPhone, the 32-bit apps on the macOS have been completely phased out. There has been a transition to the 64-bit apps since Apple has control over the App Store. The first 64-bit mobile processor was seen in the A7 in 2013. They had completely done away with the 32-bit apps in iOS 11. The latest versions of the Mac have the 64-bit technology and macOS which has the 64-bit apps can access more memory and also enable faster system performance. The current technologies such as Metal graphics acceleration work only with 64-bit apps. Though Apple has not set the date for the transition to 64-bit apps, it has warned that the next macOS version will not run on 32-bit apps. As can be seen with the iOS, their main aim is that the 32-bit apps on the macOS will not be supported. It is advisable for the users to either upgrade to the 64-bit apps or look for other solutions as soon as possible.